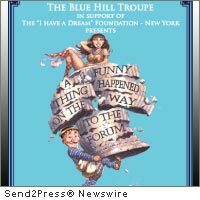 NEW YORK, N.Y., Sept. 27, 2011 (SEND2PRESS NEWSWIRE) — Blue Hill Troupe, Ltd. (www.bht.org), the only musical theater group in New York City to donate its net proceeds to charity, launches its 88th season with the musical farce A Funny Thing Happened on the Way to the Forum. With a score by Stephen Sondheim and book by Burt Shevelove and Larry Gelbart, Forum will run from October 28 through November 5, 2011 at Theatre at St. Clement’s, 423 West 46th Street. The Blue Hill Troupe produces a musical every fall and a Gilbert & Sullivan operetta every spring, and has donated over $3 million to local charities since its inception in 1924. Proceeds from Forum will benefit the “I Have A Dream” Foundation® – New York Metro Area (IHDF-NY) (www.ihaveadreamfoundation-ny.org). “Tragedy tomorrow, comedy tonight!” Broadway’s greatest farce is light, fast-paced, witty, irreverent and one of the funniest musicals ever written – the perfect escape from life’s troubles. Forum takes comedy back to its roots, combining situations from the time-tested, 2000 year-old comedies of Roman playwright Plautus with the infectious energy of classic vaudeville. The result is a non-stop laugh-fest in which a crafty slave struggles to win the hand of a beautiful but slow-witted courtesan for his young master, in exchange for freedom. WHEN: October 28, 29; November 2, 3, 4, 5 at 8:00 p.m.
October 29; November 5 at 2:00 p.m.
October 30 at 3:00 p.m.
WHERE: Theatre at St. Clement’s, 423 West 46 Street (between 9th & 10th Avenues). Please note: no elevator access to the theater; stairs must be negotiated. TICKETS AND INFORMATION: $28-$48 per person at www.bht.org or call 866-811-4111. The Blue Hill Troupe is proud to partner with the “I Have A Dream” Foundation – New York Metro Area for the 2011-2012 season. For over thirty years, IHDF-NY has been sponsoring entire grade levels of students in under-resourced public schools and housing developments, and working with these “Dreamers” from early elementary school all the way through to college. Upon high school graduation, each Dreamer receives guaranteed tuition assistance for higher education. By helping Dreamers gain access to college, IHDF-NY is putting them on a different academic and life trajectory, while having a broader impact on the students’ families and the generations that follow. In April 2012, the Blue Hill Troupe will unveil a newly revised and reworked edition of Gilbert & Sullivan’s wickedly relevant political satire Utopia, Limited. In its 88-year history, the Blue Hill Troupe has produced the entire Gilbert & Sullivan canon, including Thespis, the pair’s first collaboration, to which Sullivan’s score has been lost. In June 2008, the Blue Hill Troupe presented a concert version of Thespis, with a new score by Grammy Award-winning composer and record producer Thomas Z. Shepard. In 2005, the Blue Hill Troupe was honored with three awards at the 12th Annual International Gilbert & Sullivan Festival in Buxton, UK, for their innovative production of the G&S rarity, The Grand Duke. The Blue Hill Troupe has been featured on CBS Sunday Morning and appeared with The New York Pops at Carnegie Hall. For fifteen years, they presented a Gilbert & Sullivan concert as part of the Metropolitan Museum of Art’s Concerts and Lectures series. Original Keywords: IHDF-NY, director Andy Sandberg, Blue Hill Troupe Ltd, I Have A Dream Foundation, score by Stephen Sondheim and book by Burt Shevelove and Larry Gelbart, Theatre at St. Clement’s, New York events, musical theater group, I Have A Dream Foundation New York Metro Area Blue Hill Troupe, Ltd. New York New York NEW YORK, N.Y.
REFERENCES: Entertainment News, IHDF-NY, director Andy Sandberg, Blue Hill Troupe Ltd, I Have A Dream Foundation, score by Stephen Sondheim and book by Burt Shevelove and Larry Gelbart, Theatre at St. Clement's, New York events, musical theater group, I Have A Dream Foundation New York Metro Area Blue Hill Troupe, Ltd. New York New York NEW YORK, N.Y.